Sarah and I would love to wish you and your families all the the very best for 2012! We hope that this year is full of good times with family and friends, and leaves you plenty of time for creative pursuits. Sarah has baked up a batch of coconut cupcakes to start the New Year off with some sweetness. 1. Preheat oven to 180 deg C (350 F). Line muffin tins with paper liners. Sift together flour and baking powder; stir in coconut and almond meal. 2. With electric mixer on medium/high speed, cream butter and sugar until pale and fluffy. Add essence and then eggs, one at a time, and beat until incorporated, scraping down sides of bowl as needed. Reduce speed to low. Add flour mixture in three batches, alternating with two additions of coconut milk, beating until just combined. 3. Divide batter evenly among lined cups, filling each 3/4 full. Bake, rotating tins halfway through until golden and cake tester comes out clean, for 20 -22 minutes. Turn onto wire rack to cool completely. 4. Frosting: combine butter, sugar and coconut essence , and whisk in hot water until it is has reached the desired consistency. Spread on cool cakes and decorate with pearls. 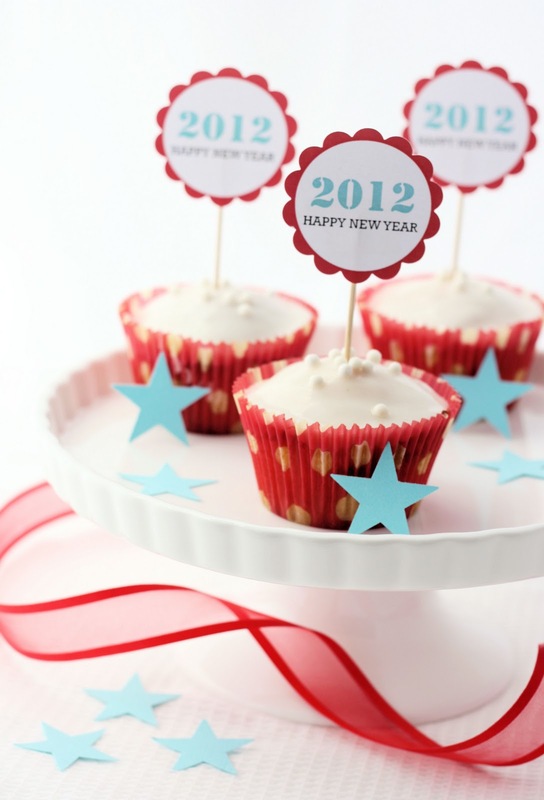 If you would like to make some cupcake flags, click on the link below to access the pdf file. Print them out on a sheet of white card, and then use a 2 inch scallop or circle punch to cut them out. Tape a toothpick to the back using a piece of masking tape. 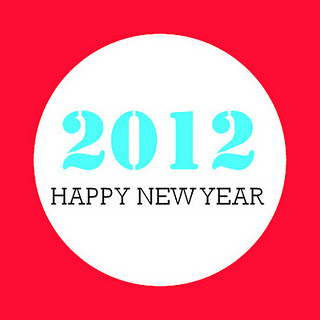 Best wishes for 2012! 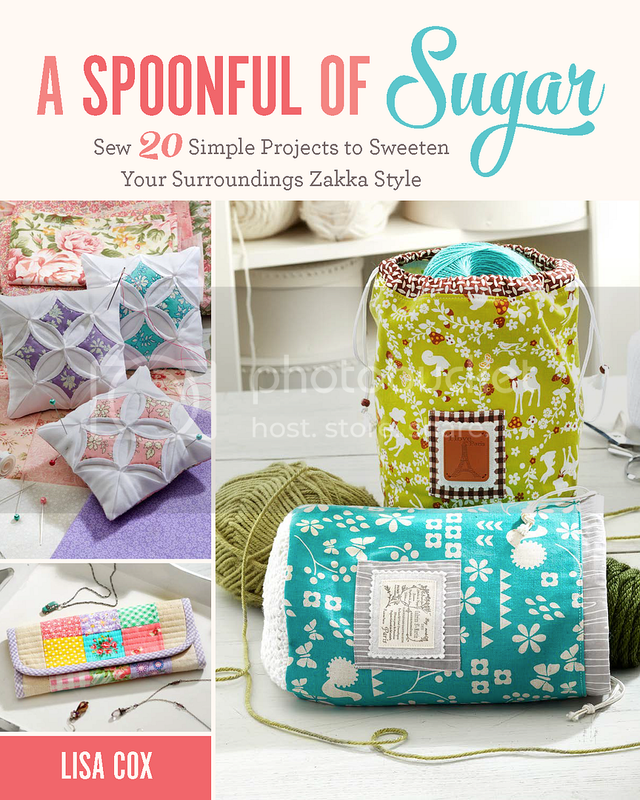 We hope you will continue to stop by our space here for lots of projects, tutorials, recipes,and inspiration! Gelukkig nieuwjaar for you and your loved ones! Wow, this is a wonderful recipe. I love coconut! Happy New Year, I’m ready to be inspired even more! Happy New Year Lisa and family! 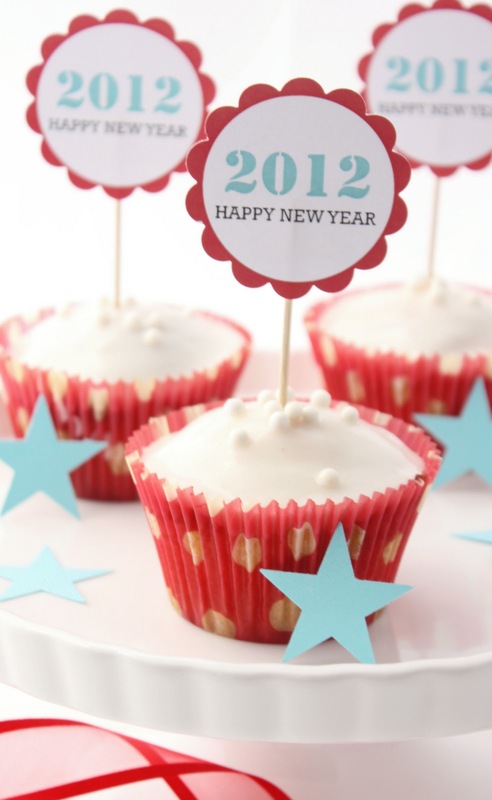 Cute little cupcake flags! Thanks for sharing the template. A very happy New Year 2012 to you and your family too Lisa! Here’s hoping it’s a great one! Thanks for sharing the template. I love making cupcakes, I try to make a new kind every month for some silly reason! Happy New year! Happy New Year Ladies! Those cupcakes are Beautiful!!! très belle et douce année !! !